The price is the center of attraction for both the parties. Therefore, while choosing a repair company, do not contact the organization that promises you to repair refrigerators at too cheap rates. But, you should check all their conditions properly. As the price for the repair of equipment as a refrigerator consists of the work of the master, the cost of replaced parts, the cost of equipment for the diagnosis and repair of refrigerators that include advertising costs, taxes and many others expense. So, it cannot be cheap. As a rule, if any organization offer low price repairing means they are using some unfair means to hide the real value and can cheat you later. On the other side, if the price of services is too high, then this is not a guarantee of quality. n a good campaign, during the first call, the master will tell you all the details of the upcoming refrigerator repair, suggest the cause of the refrigerator malfunction and call the preliminary minimum and maximum repair costs, as well as what it will depend on. While searching for the organization, always go with the company that offers you a warranty. Basically, for serious organizations guarantee for work can be several months and for replacing the parts could be for several years. 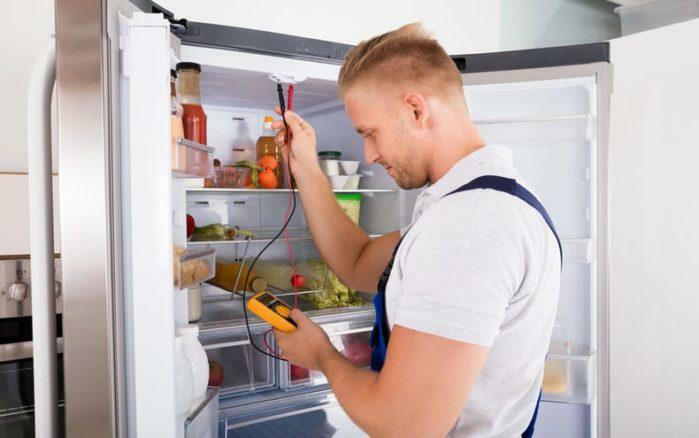 Upon completion of the repair, these organization provides a special document certifying the guarantee for each replaced part of the refrigerator during its repair. It is highly essential to pay attention to the age of the campaign. This is important because the quality repair of refrigerators requires not only special knowledge, special equipment, but also experience. As young organizations can gain experience by stuffing cones on your order, replacing parts of the refrigerator one by one. Whereas experience companies hire the master that can “correctly diagnose” your refrigerator right the first time. If you are looking for an organization to repair refrigerators via the Internet, then pay attention to the quality of their site and its age. The easiest way to get quality repair company is to understand its large number of reviews. Before hiring, be sure to clarify whether the campaign has experience in repairing refrigerators of your brand or not. As fundamentally household refrigerators differ only in external dimensions and arrangement of individual elements. It is sometimes necessary to take into account the peculiarities of a specific refrigerator brand when repairing it. While hiring a company, it is required to pay attention to the refrigerator company scheme. Like for the repair of domestic refrigerators, most companies use - order acceptance; departure of the master to the house, inspection of the refrigerator by the master, budgeting, elimination of defects, refrigerator test and then filling out warranty documentation. So, if your chosen repair company perform all these functions means they are highly professional and you can go with them. The prefixed date and time are always important to perform any repairing function. So, while considering the repair company always check, whether their master can come at your doorstep with pre decided time or not. As many companies also work for 24*7 services. So, you can also choose from them as per your convenience. But remember, the night shift companies can charge a little high amount for repairs. If you are living in a region which is far away from the city. Many companies charge some special surcharge. So, be sure in advance about their travelling costs. On the other side, you prefer to send your refrigeration to their workshop, for that you also have to bear the cost. Some repair organization provides discounts on their services. This offer is normally printed on their advertisement leaflets or on the main page of the site. Be careful! Because, discounts can be provided only for regular customers or for customers only after the second (third, fourth, fifth, etc.) order. Sometimes the deadlines for granting discounts have long been over, but it continues to “magically” comes to figure in the advertising of the organization. Be sure to read all the conditions on the site in advance. Hope, the above-mentioned points help you to find the most appropriate way to do a search for your refrigerator repair company. With all these tips, be sure to take all the company and repairing information on a phone call. There are also many companies that do not hesitate to share their previous customer's information. So, in case if you have any doubt, do not feel shy to call them. Jeff Sears is professionally a technician and a part-time blogger. He is working for APlus Repair, which helps in Ge Refrigerator Repair services. He has more than 7 years of experience in repairing electrical appliances.